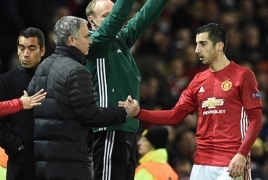 PanARMENIAN.Net - The Armenian national team captain, midfielder Henrikh Mkhitaryan's Manchester United is the most valuable football club in Europe, being worth about 3bn euros, according to business services group KPMG, BBC News reports. The Europa League winners top KPMG's analysis of top sides' "enterprise value", putting it ahead of Spanish giants Real Madrid and Barcelona. The study analysed broadcasting rights, profitability, popularity, sporting potential and stadium ownership. In the study of 32 teams, English clubs dominate, filling six top 10 places. "While this is partially explained by football's broadcasting boom, the internationalisation of the clubs' commercial operations, their investment into privately-owned and modern facilities, and overall more sustainable management practices, are also key reasons for this growth," he said. But Sartori said clubs were unable to influence their broadcasting income individually, given the collective nature of most deals. This year, 10 clubs were valued in excess of 1bn euros, two more than in 2016. Tottenham Hotspur and Italy's Juventus were the new entrants to this elite group, with Tottenham ousting French club Paris Saint-Germain from 10th position. Despite Premier League dominance, Spain was the only country with two clubs reporting an "enterprise value" above 2bn euros, namely Real Madrid and Barcelona. The report is based on financial and non-financial information from the 2014-15 and 2015-16 football seasons.